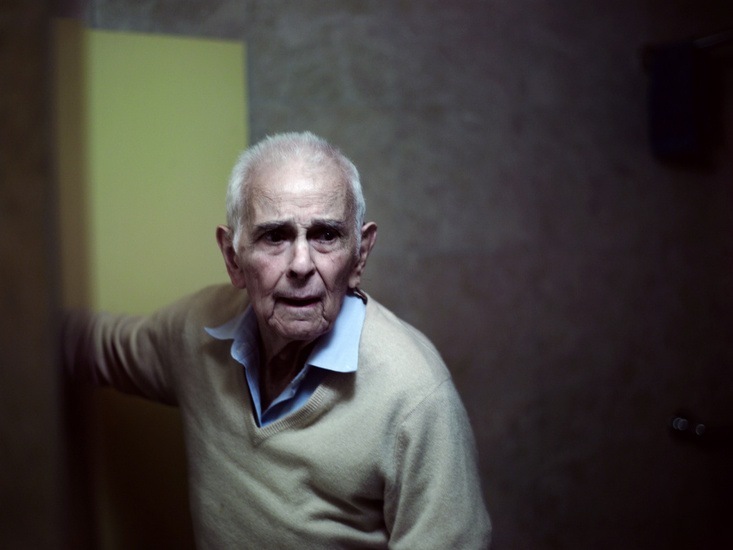 What Philip Toledano portraits is the imagination. According to himself, in photography, there should always be space for questions and doubts, lifting the viewer to a constant stage of suspense. It's like an unfinished sentence. His works -- that, sometimes, are in the shape of installation -- essentially document the North-American society: its mobilizing values, who builds it, what destroys it. "Hope & Fear" (2004) series is precisely based on this assumption. Overlaid at a grey background which varies in tones and luminosity, many human figures come up dressing hates, loves and fears installed at the contemporaneous North-American society. Through elaborated costumes and accessories, each portrait is a world of desires and paranoia in itself. 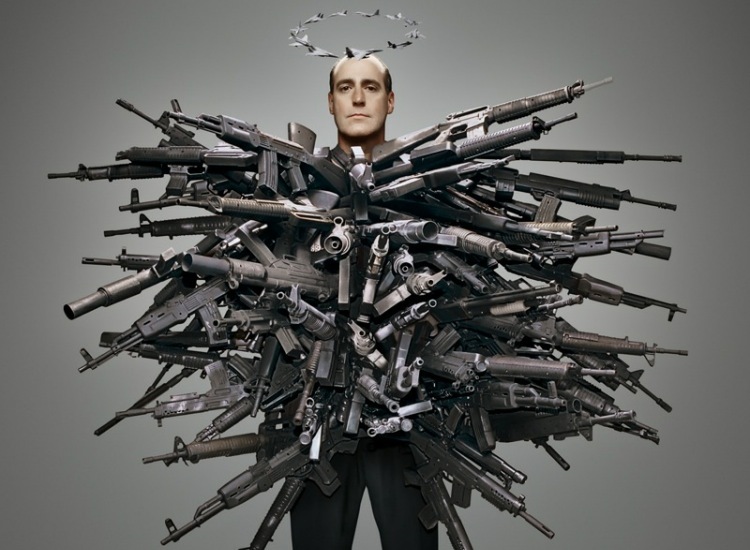 Religion and prejudice, consumption and weapons are some of the manifest themes. Between 2001 and 2003, Philip Toledano built a photographic diary that remains astonishingly reigning, as much as also could be built at any European country at times of economic crisis. 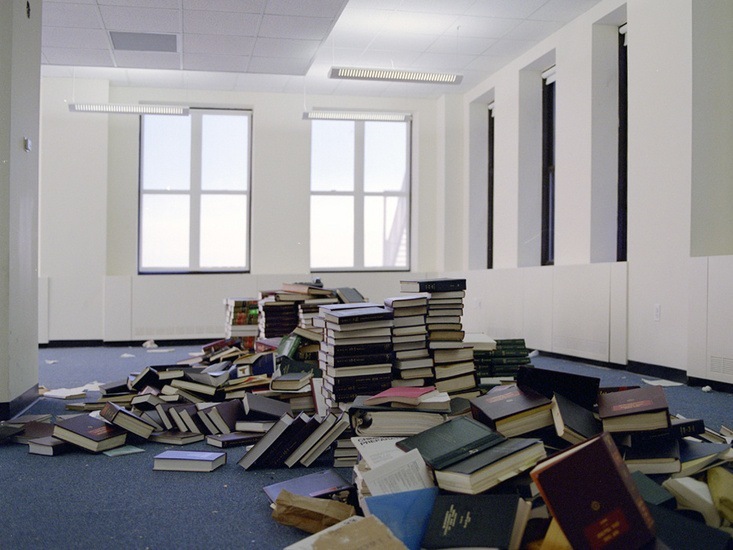 "Bankrupt" is an economic archeology exercise, says the photographer, as it's a compilation of photographs taken inside of recently abandoned offices -- places where everything that remained were the traces of extinct activity and of the lives of those worked there anyhow. It's an impressive collection of portraits about emptiness, about an interrupted life. 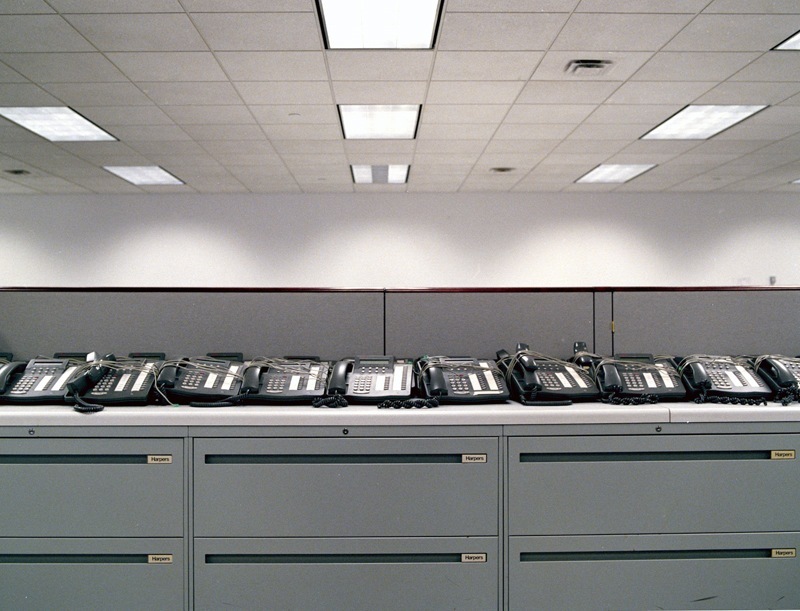 Dozens of secretary chairs piled at a small division, abandoned plastic glasses, empty cubicles, papers left on the ground, plants with no life, meeting boards written with indications and goals which can be achieved by no-one at this point. For the photographer, this is the "human cost" of the vertiginous economic recession faced by USA at that time and that's still sensed until our days, with some echoes around the world. Although the Philip Toledano's works are, most of the time, criticizing notes about society and contemporary economy, there are some other works fulfilled with an extreme sensibility, exposing a more intimate side of the photographer. 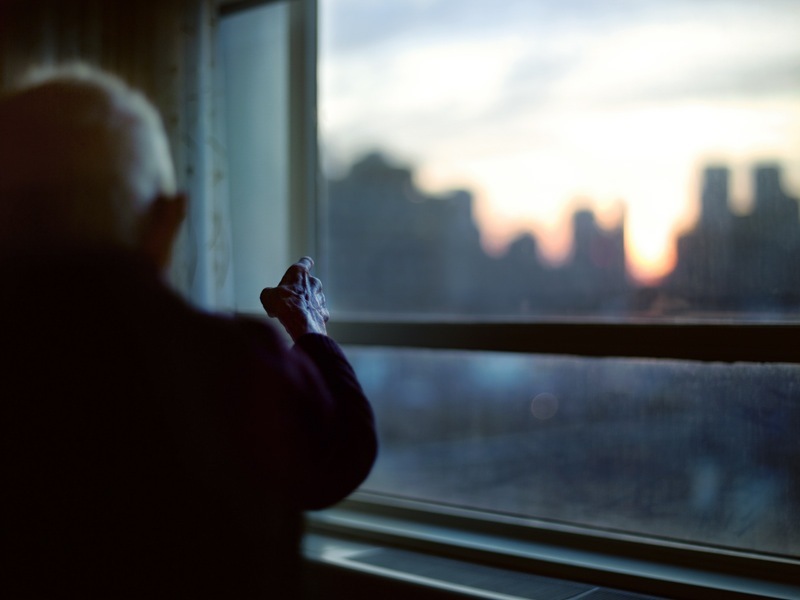 "Days with my father" is a touching series accompanied by little descriptive texts, and documents the three years that Toledano shared with his father after the death of his mother. This series impresses by the emotional honesty which goes through and had a touching feedback from the audience. 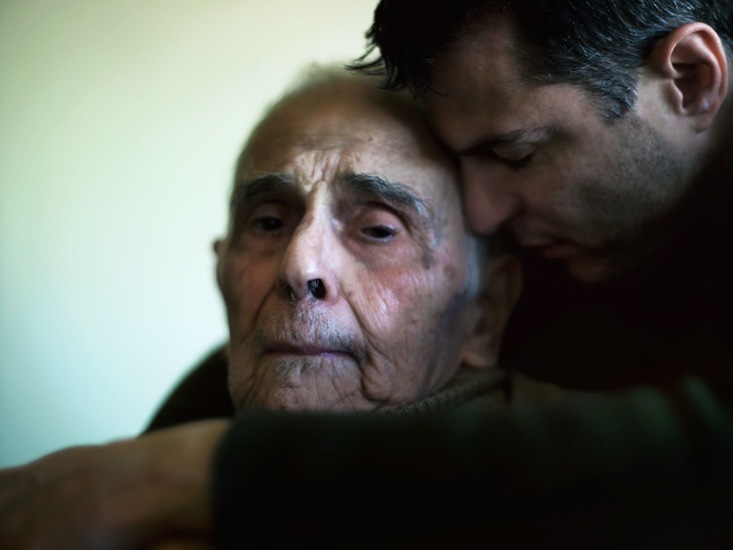 Those are portraits of the quotidian that honor the memory of Philip Toledano's father, once a Hollywood leading actor and a man who lived at the age do 99 keeping his immeasurable passion for arts, but lost his energy and his short-term memory, regularly ignoring his woman's death. "Days with my father" was book-edited in 2010, under the Chronicle Books publishing company mark. Other Philip Toledano works illustrated the pages of well-concerned publications, like The New Yorker, Vanity Fair, The New York Times, The London Times and Le Monde.